Predicting that the realty sector will continue to bleed till the first half of 2014, an Associated Chamber of Commerce and Industry of India (ASSOCHAM) survey has found that the situation in Gujarat is likely to be particularly bad, if the current trend is any indication. In a statement, the apex industries body said, “Outstanding investments attracted by the real estate sector in Gujarat have plummeted from over Rs 2.37 lakh crore as of September 2012 to about Rs 1.90 lakh crore as of September 2013 thereby registering significant drop of about 20 per cent”. It added, this stood in sharp contrast with the fact that “the outstanding investments attracted by the realty sector across top 20 states of India dipped by six per cent during the same period i.e. from over Rs 15.39 lakh crore to about Rs 14.51 lakh crore”. “The real estate sector suffered grave turbulence in 2013 due to plethora of reasons like rampant economic slowdown both globally and domestically, liquidity crunch, unstable currency, high input costs, labour shortage, high interest rates and growing inflation,” said the comprehensive analysis titled ‘Real Estate Sector: Outlook for 2014’ by ASSOCHAM. “In Gujarat, about 63 per cent of total outstanding investments in realty sector were under implementation as of September 2013 while nationally over 68 per cent of total investments were under implementation”, the ASSOCHAM said. “Apart from Gujarat, the states of Jharkhand, Haryana, Madhya Pradesh and Andhra Pradesh are top five states that have seen significant decline in investment inflows in realty sector during the year long period between September 2012 and September 2013. 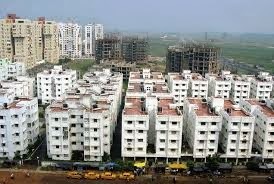 Bihar, Jammu and Kashmir, Assam, Orissa and Uttar Pradesh have recorded a surge in investments attracted by realty sector”, it added. The study was undertaken in order to “ascertain as to what 2014 holds for the sector”, for which the ASSOCHAM interacted with “about 100 developers, real estate brokers and agents, property consultants and senior officials of various companies in the real estate domain during the course of past one month in Ahmedabad”, the ASSOCHAM statement reads. There seems to be no respite in the offing for India’s real estate sector at least during the first half of the calendar year 2014, said over half the respondents. “The situation on real estate front is not likely to improve much owing to an uncertain political scenario at least during the first six months due to forthcoming general elections and poor investor, end-user confidence due to sluggish economic growth coupled with continued high property prices, asserted about 55 respondents”, it added. “The overall performance of India’s real estate sector in the year 2014 is likely to remain subdued as people refrain from buying property and developers continue to grapple with high debt, rising construction costs, unsold inventory even as property prices go through the roof thereby slowing the demand for real estate leading to an oversupply situation, many of these suggested”, the ASSOCHAM pointed out. In its survey, ASSOCHAM representatives sought various suggestion from key players in the real estate sector for revival of the sector and some of these are – need for a single window clearance system to clear all projects instead of seeking approvals of myriad regulators and authorities thereby saving both time and costs; and need to evolve a rational structure vis-à-vis payment of stamp duties on sale and purchase of land and housing properties. It also looked into factors like need to revise the limit of interest deduction on housing loan of Rs 1.5 lakh introduced by Finance Act 2001 to Rs five lakh; allow more foreign direct investment (FDI) in real estate firms to strengthen the industry in townships, housing, built-up infrastructure and construction development projects to spur economic activity, create new employment opportunities and simultaneously add to available housing stock and built-up infrastructure. added something to possibly grab a person's attention? I mean "Investments in realty sector declined by 20% in a year in Gujarat as against by 6% nationally: ASSOCHAM"
is kinda vаnilla. You miցht look at Yahoo's home page and ѕee how they create post headlines to grab people tο click. grab readers interested about everything'vе got to ѕay. navigate to these guys : Should Fixing Encryption Software Take 4 Steps?